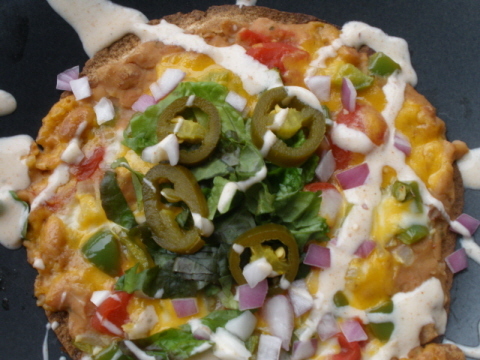 WEEK 3: Vegetarian Fiestado Pizza – Feliz Navidad! For week 3 of the 52 weeks of pizza I am taking a giant leap away from what we typically consider pizza and offering you a culinary diversion the Friday before Christmas. But, what could I offer to represent Christmas? Something red, white and green perhaps? How about something a bit more festive for my Christmas tidings? Enjoy these individual fiestas! I want to wish you a Merry Christmas from the bottom of my heart! Preheat oven to 450°. In a medium sized sauce pan heat over medium heat. Once hot add EVOO, garlic, green pepper, and onion. Stir occasionally until onions become translucent. In the mean time heat a skillet over medium heat. Once hot add one tortilla to the dry skillet and cook until browned about 2-3 minutes. Flip the tortilla and brown the other side. Repeat for tortilla for second serving then set both aside. Once the green pepper, and onions are cooked, transfer to a small bowl and set aside. Now add the drained pinto beans to the same sauce pan and continue to cook over medium heat. With the back of a wooden spoon smash some of the beans against the side of the pan. This will give the beans a paste-like consistency. Once they are heated through you can begin to assemble the "pizzas". On a baking sheet place your two tortillas, layer the ingredients dividing toppings between the two servings in this order: beans, thin layer of salsa to cover the beans, green pepper and onions, and finally the cheese. Bake at 450° for 8-10 minutes, or until cheese melts. Once the pizzas are done feel free to garnish at will! You can see some suggestions listed above. The only thing keeping this dish from being vegan is the cheese, substitute with a cheese alternative.